First built in as a fortress 1569. It given to Hosokawa Tadaoki after the battle of Sekigahara (1600) who built the castle next to the fortress. Has was transferred to Kumamoto in 1632. Miyamoto Musashis connection was as a retainer of the Lord Hosokawa in Kumamoto. The castle was inherited by Ogasawara Tadazane. His work was to keep surveillance on the other clans in the Kyushu area. Musashis son Miyamoto Iori was in turn a retainer of Lord Ogasawara. He inherited Mt. Tamuke from this Lord. t is made up of five stories the fifth being bigger than the fourth. It has been burned down and rebuilt twice. During the WWII it was the headquarters of the 12th Division Infantry and at that time escape destruction due to the second A-bomb target being redirected from Kokura to Nagasaki due to bad weather conditions. I After the war it was used by the American occupational forces and was returned to the Japanese people in 1957. 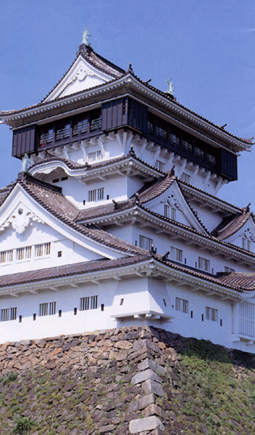 The design of the castle is known as Karazukuri because of the Chinese overtones. At the age of fifteen I inspired to study. I came independent at thirty. At forty I was certain what I ought to do. I succeeded in the mission given to me from heaven by fifty. I could begin to listen to others at sixty and did not break the natural law (did not go far) even though I did everything as I wanted to do at the age of seventy. The words of Miyamoto Musashi, To become independent at the age of thirty means that he established himself. This is the beginning stage of Satori (spiritual awakening), when he does not fall back (from the top of the allegoric pole) in the Buddhist Law. Miyamoto at 29 reached this beginning stage by establishing himself and by saying, My Hyoho is not the utmost. From then on he trained himself night and day to seek the truth, and by the age of fifty he finally realised the way of Hyoho. This is what Confucius meant when he said that he had learned heavens decree by the age of fifty. At the beginning of the Earth Book Hyoho no michi to iu koto (Words about the Hyodo Path), Miyamoto explains the principle that swordsmen should study as follows: In recent times there are men, living and styling themselves as swordsmen. However they only teach the standard techniques of fencing. 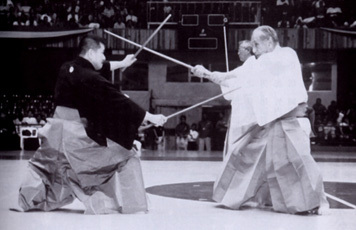 Recently the Kashima and Katori priests have established their respective schools of sword techniques as, Tutelage's of the Gods and tour the land teaching people. These are events of recent years. Since ancient times Hyoho has been included among the Juno (ten skills) and Hachigei (Seven Arts) as Rikata (profitable measures). Truly, rikata is one of the arts. Although it is not just limited to standard sword techniques. It is difficult to know the art of the sword solely by means of techniques. Needless to say such swordsmanship can never rival the principles of Hyoho. What does Miyamoto mean by rikata? He means divine favour in Buddhist Law, in other words the way benefiting oneself and others. Jiri means to seek self awakening and to be awakened. Rita means to assist others with the virtue of that awakening, so that they may benefit from you. By taking one more step forward, priests and monks practice Zen as a means of self awakening. However the hyo-hosha (strategists) have said from ancient times, that they are awakened spiritually through the way of the sword. As a result both sword and Zen aim at the development of human beings.